Stara Sava is characterised by extremely rich ironmaking tradition. It has all the essential elements of a former iron foundry settlement: Ruard Manor from the 16th century, Church of St. Mary’s Assumption from the beginning of the 17th century, Kasarna with workers’ flats from the end of the 18th century, a blast furnace with a puddling mill, storage for charcoal and a mill from the 19th century. Today the area serves for museum, culture and tourist activities. creative workshops Drawing with charcoal, Miner’s lamp, Making candles in the shape of a blast furnace, Making use of wire, Sundial. You can experience Stara Sava by joining organised guiding and finish the visit by a worker’s snack, served in Kolpern. 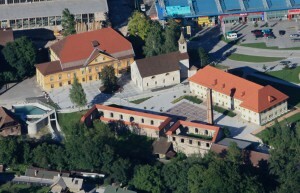 The culinary experience is completed by showing a film about the former ironworks Žar jekla – SM jeklarna (The Glow of Steel), Jeseniški plavži (Jesenice blast furnaces) , Zgodovina železarstva (History of Ironmaking) or life of workers and the first nurse (Angela Boškin – Poti k ljudem (Paths to people)). You can also join a guided tour along the old mining path to Planina pod Golico.